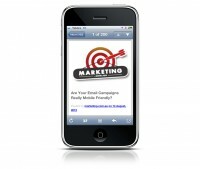 Are Your Email Campaigns Really Mobile Friendly? Do you want to make the most of every opportunity to engage with your customers? Ever wondered why your email campaigns are just not performing? Well perhaps you need to review whether your email campaign is really mobile device friendly. Sender and the subject are key – For many mobile device users, the sender and subject could be the only fields they see as they browse through their inbox. You want to grab their attention. Mobile friendly text – Make sure you use large and clean style fonts to increase readability on the small mobile screens. Short and sweet – Make sure the email is not too long for smaller screen devices. Get to the point quickly, you may only have your reader for a few seconds. Don’t get too fancy – You may like an exciting email template with special graphics, images and video but this is a sure way to annoy the mobile user. They don’t want to wait for it to download. If you use images then use them sparingly. If your images don’t render, you don’t want the reader to see a blank screen. Stick to a single column – If the user has to scroll left, right, up and down just to read the email they’ll just get frustrated and you’ll lose them. Think tap not click – Design your email with big buttons and links, remember lots of fingers and fat thumbs will be tapping around so make it easy for them. Use mobile friendly links – Make sure that all destination links are mobile friendly (i.e. redirect to a mobile website) and that sharing and forwarding your content is super easy. Test it and track it – Check the test email on a mobile device before you send it out. Once it’s launched, review how the campaign performs at your mailing list manager. This is the best way to gauge what really works for you and what doesn’t. If you’d like more information on email compatibility, we urge you (and your designers and developers) to check out the Email Standards Project. Here you will find a great resource of features that work on various email clients. Chris Burgess is a web technology consultant from Melbourne, Australia.